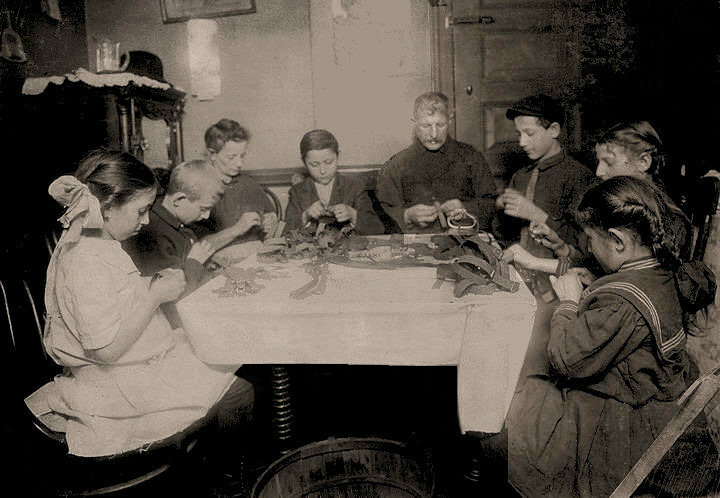 Struggling Families: A Jewish family and neighbors working until late at night sewing garters. This happens several nights a week when there is plenty of work. The youngest work until 9 p.m. The others until 11 p.m. or later. On the left is Mary, age 7, and 10-year-old Sam, and next to the mother is a 12-year-old boy. On the right are Sarah, age 7, next is her 11 year old sister, 13-year-old brother. Father is out of work and also helps make garters. New York City.